As seen in the Fall 2016 issue of Park Pilot. In June of each year, pilots from across the country pack up their LiPo batteries, field boxes, spare propellers, sunscreen, and tents and head to the IAC (International Aeromodeling Center), in Muncie, Indiana. They leave behind their worries and, sometimes families, for a weekend of fun. 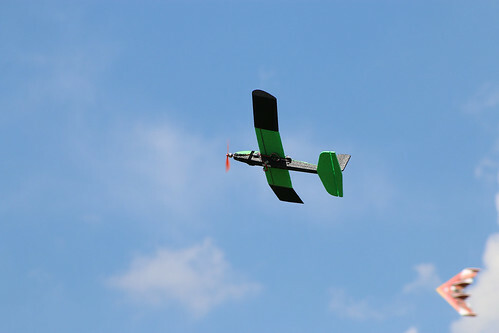 This escape, known as NEFI (National Electric Fly-In), allows pilots to relax and enjoy their favorite pastime: flying electric-powered model aircraft. If they crash an airplane, they fix it. If a battery dies, they charge it. If the flightline is full, they patiently wait for a turn while chatting with friends. Bob Johnson (L), from Fond du Lac WI, looks relaxed while he flies his sailplane. Art Conner, from Mobile AL, watches the flight. Gary Williams, from Lima OH, performed some amazing 3-D flights with this Precision Aerobatics Addiction XL. If the event attendees don’t win one of the coveted raffle prizes, they buy more tickets. The raffle and event proceeds go to charity, and the pilots don’t hesitate to pull out their wallets and purchase tickets in batches of 100. This year, roughly $2,000 was raised for AMA’s National Model Aviation Museum and Animal Rescue Fund, which is a no-kill animal shelter in Muncie. NEFI 2016 was similar to previous years, especially when it came to Muncie’s unpredictable weather. On the first day of the June 10-12 event, a thunderstorm with a heavy downpour rolled in during the morning, soaking the grounds, tents, and even an aircraft that was left underneath one of the tents overnight. As soon as the last raindrop fell, however, a line of eager pilots formed at the registration table. After checking in, some of the pilots took to the flightline before the pavement had a chance to dry. The rest of the weekend brought perfect flying weather. The sun stayed out and there was no more rain. More than 50 pilots showed up throughout the course of the weekend to fly their favorite park flyers, multirotors, jets, sailplanes, helicopters, and warbirds. When a unique aircraft turned heads, the pilot was happy to share the details about how it was built or where it was purchased. This included a Sky Hero 580, owned by John Zankl, who made his first trip to NEFI this year. His large multirotor featured several LED lights, and John’s FAA registration number and AMA number were painted on the aircraft’s body in Klingon. When the sun went down, John flipped on the lights and flew it and his 16-inch Sky Hero 1000. Also at the event was an eye-catching red and white Pitts Special owned by Don Belfort, and a sharp E-flite Deuces Wild, owned by Mike Sommers. Mike also brought along a 30-year-old green, white, and blue Glenn Spickler Quickie 500 that was owned by his father. In addition to these aircraft, several warbird park flyers participated in warbird gaggles. The pilots, their spotters, and the spectators all seemed to enjoy watching military models from several eras make laps in the sky. This sharp-looking Pitts Special, owned by Don Belfort, was flown at NEFI 2016. The warbird gaggle featured several foam replicas of wartime aircraft, including this Focke-Wulf. Pilots of all ages also participated in several rounds of RC Combat. Flying wings, slower airplanes, and foamies battled it out for prizes. Several times, the contest director, Jay Smith, encouraged the pilots of faster aircraft to hit the slower ones. If aircraft were damaged, the pilots all seemed to have spares tucked away somewhere for the next round. Those who lost did so with smiles on their faces, and made sure to congratulate the winners with a pat on the back. Some of the RC Combat prizes came from the raffle prize table, which included propellers, batteries, kits, multirotors, T-shirts, hats, etc. that were donated by several manufacturers (see the sidebar). When the winning raffle prize numbers were announced on the portable speakers, the pilots quickly scrambled to fish out their tickets in hopes of being a lucky winner. Although it’s a competition, at one point RC Combat looked almost like an aerial ballet. At the end of the day on Saturday, numbers were drawn until most of the prizes were handed out. Jay made sure that everyone, even those whose numbers weren’t selected, went home with a prize. One generous pilot ensured that a young boy who wandered over to NEFI from a Free Flight event held at another site at the IAC did not go home empty handed. NEFI is a fun event for kids of all ages, including these three who were participating in and watching RC Combat. (L-R): Michael Swortzel, Jordan Garypie, both age 13, and Griffin Garypie, age 9. One of the regulars at NEFI is Roger Wheeler. He always seems to have a smile on his face. Although the event closed at 5 p.m. on Friday and Saturday, some of the pilots continued to fly until after the sun slipped below the horizon. On Saturday, the last full day of NEFI, the flying stopped in the evening for the pilots’ dinner. NEFI veterans and those who were attending the event for the first time enjoyed each other’s company as they ate pizza, drank sodas, and recalled the day’s events. By Sunday afternoon, the tents were down, the equipment was packed, and the field was again silent. As the pilots began the journey home to their jobs and families, they likely thought about the fun they had in Muncie and drove with smiles on their faces. If I had the finances, I'd come.